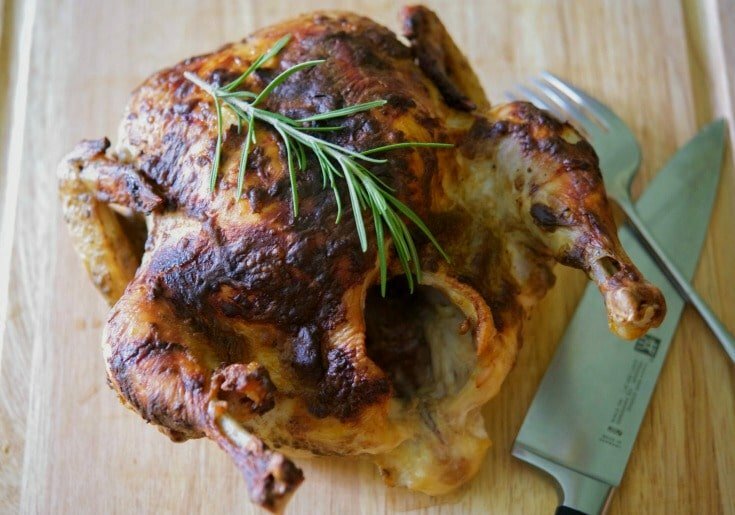 For a simple whole roasted chicken with robust flavor, try this one made with a marinade of Dijon mustard, balsamic vinegar and fresh chopped rosemary. Sunday at our house generally mean some type of larger meal; most likely midday. And generally speaking in the cooler months, it involves a roasted meat like this simple to make Dijon Balsamic Roasted Chicken. I love making a roasted chicken at least twice a month because with only three of us left at home, we never can eat the entire thing ourselves. Which means it’s the perfect opportunity to make something with the leftovers like pot pie or soup. 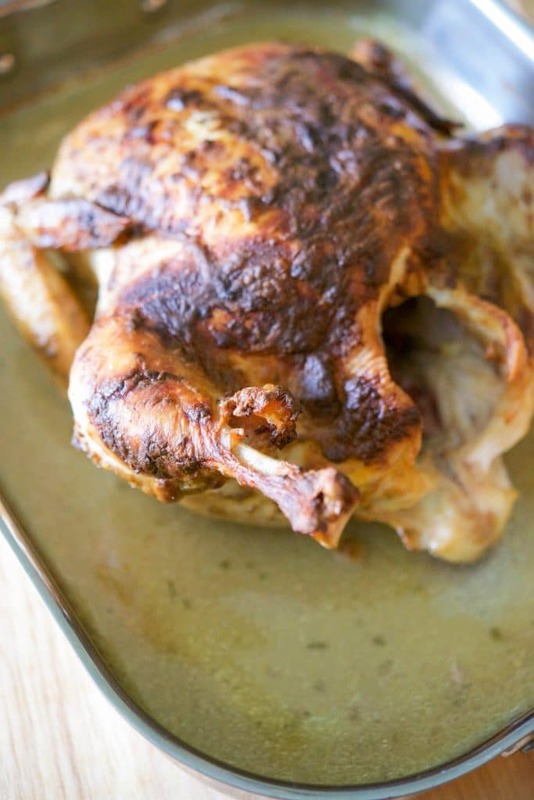 We have several favorite whole roasted chicken recipes like the one where I brine it in apple cider or the one using fresh herbs to make a chimichurri paste. However, this particular recipe is one of our favorites; well really one of mine because it’s so easy to make. All you need is a whole roasted chicken, balsamic vinegar, Dijon mustard, fresh rosemary and extra virgin olive oil. Well you need salt and pepper too, but who counts that? 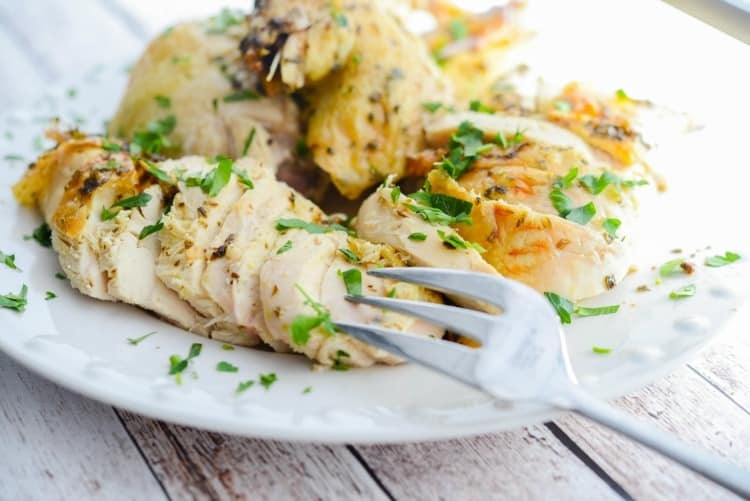 Combine the vinegar, mustard, rosemary, oil, salt and pepper in a bowl and brush over the chicken. 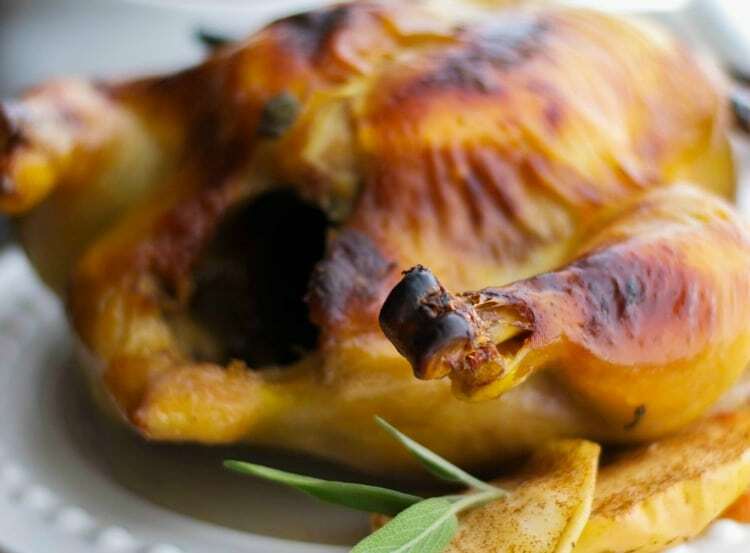 Place the chicken in a roasting pan; then add chicken broth or white wine to the bottom of the pan to baste the chicken. 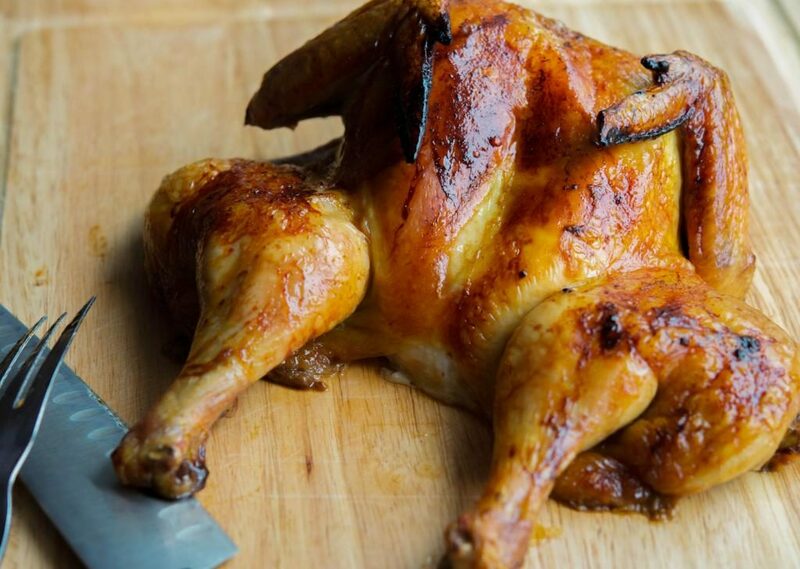 When basting the chicken; however, I don’t recommend doing it often or you will rinse off the marinade. Roast for 1 1/2-2 hours or until the internal temperature is 180 degrees F. I know the minimum is 165 degrees, but I have this phobia about eating raw chicken because I got food poisoning once and it’s an experience I never want to encounter again. 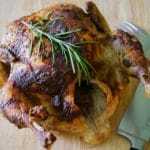 In any event, try this Dijon Balsamic Roasted Chicken the next time you are looking for an easy Sunday dinner. The flavor is incredible and I guarantee your family will love it as much as mine does. I like to keep with the same flavors when I’m cooking so I served these with Balsamic Rosemary Roasted Potatoes and Sea Salt Roasted Green Beans. ~Enjoy! In a bowl, whisk together the vinegar, mustard, rosemary, oil, salt and pepper. Add the chicken to a roasting pan, baste with the marinade; then add the chicken broth to the bottom of the pan. Roast for approximately 1 1/2-2 hours or until internal temperature of 180 degrees is reached; basting the chicken gently once so as to not remove the marinade. Remove from oven and let rest for about 10 minutes before carving. 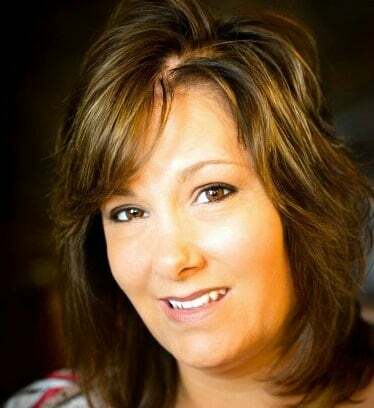 The marinade sounds amazing, Carrie! 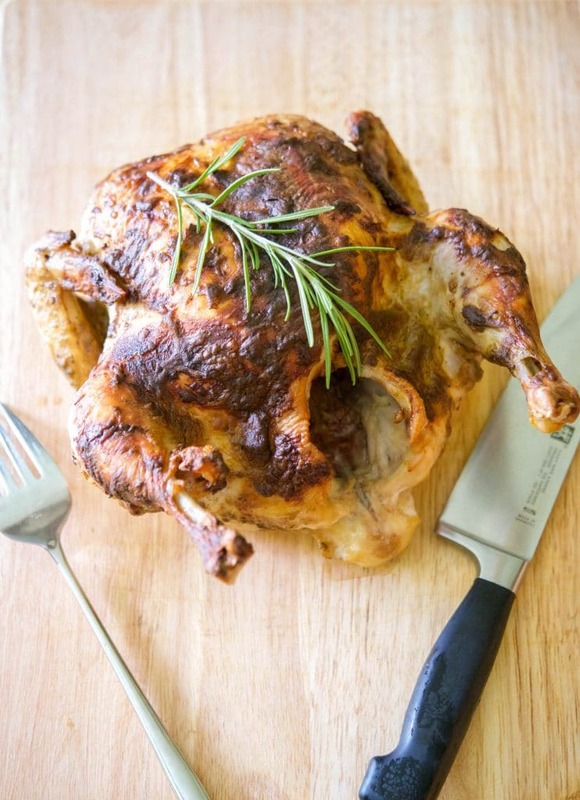 I love roasting chickens, it’s so easy and the kitchen smells amazing while it’s roasting. It sure does and this one was terrific! Looks delicious. Loved the marinade too !! Carrie, that looks really good… you make mention of Dijon Mustard in the recipe title, but I don’t see it in the ingredients. I’m not trying to be your editor here (lol), but I wanted to make sure I have all of right ingredients. Uncovered? I’m using a Dutch oven. This recipe is for use in a regular oven, so I’m not sure how it will come out in a Dutch oven on top of the stove. If you are putting it in a Dutch oven in a regular oven, then yes I would leave it uncovered.